Recorded live in October and November 2000 during a Canadian tour. It may not come as a complete surprise to listeners who have been following Canadian saxophonist François Carrier’s work, but his new trio record has a very odd sense of coherence. It’s odd for two reasons: one, because Play was compiled from a total of seven different appearances during the trio’s 2000 Canadian tour, at locations from British Columbia to Nova Scotia; two, because most of the recording (six of eight tracks) consists of fully improvised music. Somehow all those stops on the road hang together quite nicely when the deed is done. 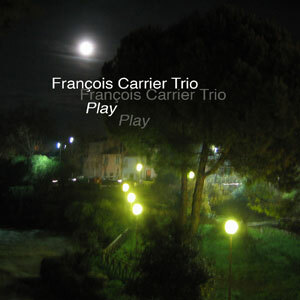 This is the first time Carrier’s trio with bassist Pierre Coté and drummer Michel Lambert has made a record without guests, and the unpredictable dynamics of their interaction reward close attention from start to finish. They’ve spent enough quality time together to develop the kind of intuitive connections that are required to make spontaneous music like this work, and it shows. Play is considerably more abstract than All’ Alba , which was recorded in 2001 in the studio with pianist Uri Caine. “Le Marais” reflects the way the group explores color and melody, progressing through phases of cascading notes, sporadic interplay, animal-like noises (that’s Coté’s bow), edgy lyricism, up-tempo swing, and a polyrhythmic riff-driven jam, ending softly and unexpectedly on a gentle note. Lambert plays very assertively, sparking developments at several phases during the group’s musical evolution. He’s often responsible for keeping an uneasy balance between inside (swing/regular meter) and outside (color/accent) playing, usually preferring the latter, respecting time but almost never steaming forward without some friction along the way. Both of the actual Carrier compositions (recorded at the United Anglican Church in Invermere, BC) start out lyrically, and they’re not a challenge to spot among the improv material. Ironically, though, one of the fiercest climaxes comes with one such piece, “La Danse de Grand-Mie”—controlled intensity, not bleating animalistic fury, but unmistakable nonetheless. The interaction among these three players reveals literacy with the post bop and free music continua, but it’s not the sort of free-quoting postmodern multilateralism that characterizes the Dutch or downtown New York schools, for example. Play is more about listening and responding, developing ideas together and then not hesitating to move on when the right time comes. Not an easy feat, but these involved improvisations (most average ten minutes) pull it off with intelligence and style. I have to confess to a certain bias against the saxophone-led trio, as it is often an easy way for saxophonists to economically record, sometimes without anything new to say. That is emphatically not the case here, and while this configuration seems to be a dime-a-dozen these days, what distinguishes this one is the powerful sound of its leader on alto saxophone. Each of these trio pieces is fully improvised, except for “Insomnie” and “La Danse de Grand-Mie,” which were composed by Canadian saxophonist François Carrier, who leads his trio through an exciting collection of performances. The album is a sort of compilation from different venues, although the unifying factor is that Carrier uses the same personnel each time. Carrier totally commands his horn, spitting out a flow of ideas that is almost breathless in its virtuosity. The stark contrast between the composed tracks and the improvised ones demonstrates Carrier’s talents as an improviser and writer. While his solos on the freely improvised pieces are impressive for their inexorable intensity, as a composer he shows a different, overtly melodic side, particularly on “La Danse de Grand-Mie.” As a unit the trio is solid as a rock, with Michel Lambert a forceful presence who is capable of gentle prodding when called for, as on “La Marais,” with occasional disconcerting rim shots from left field, and Pierre Côté an especially singular voice on bass, as his percussive elements and improvisational acumen add immeasurably to the mix. Carrier, though, is clearly in charge, as he dominates every track with his extraordinary, almost thrilling, rapid delivery and his confident voice. On “Open Conversation,” Carrier solos sans rhythm for a short time, before the bass and then the drums add support. While this reviewer seems to have somehow missed Francois Carrier’s previous output, this album clearly evidences his exciting talent, which should not be missed, especially by those who enjoy the alto saxophone.